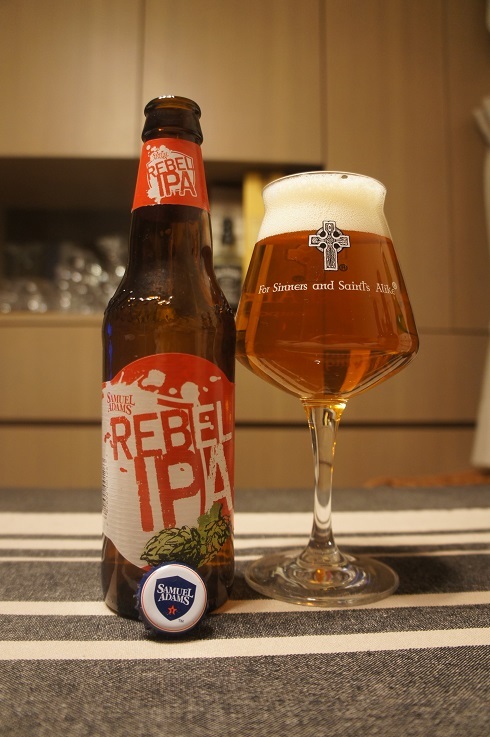 Brewer Description: Didn’t try too hard to find, but the official description for the Rebel IPA was already replaced by the newer 2017 version, of which this was not. Intro: A 355ml bottle with a notched best before date of March 2018. Poured into a Lost Abbey teku glass. Appearance: A nice and clear dark orange copper colour with an almost two finger white head with good retention while leaving lots of nice lacing. Aroma: Sweet caramel and biscuit malt with hints of grapefruit and pine. Taste: Very malty caramel and biscuit, with light pine and grapefruit and some lasting bitterness on the finish. Mouthfeel: Medium bodied with moderate carbonation and a dry-ish finish. Overall: Not bad, but too malty an IPA for my liking. 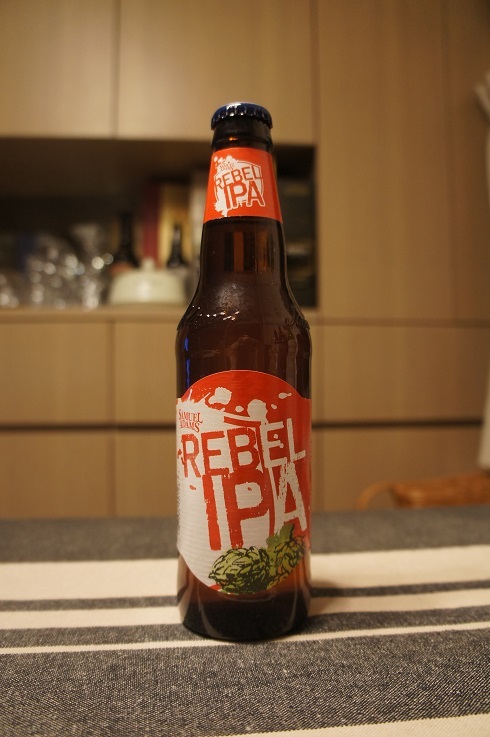 Apparently the new version of the Rebel IPA they made in 2017 is more tropical fruity and I feel that may be more my thing. 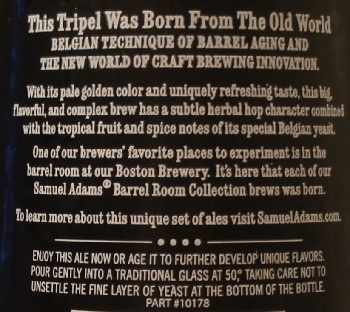 Brewer Description: (from bottle) This Tripel was born from the Old World Belgian technique of barrel aging and the New World of craft brewing innovation. With its pale golden color and uniquely refreshing taste, this big flavorful, and complex brew has a subtle herbal hop character combined with the tropical fruit and spice notes of its special Belgian yeast. One of our brewers’ favorite places to experiment is in the barrel room at our Boston Brewery. 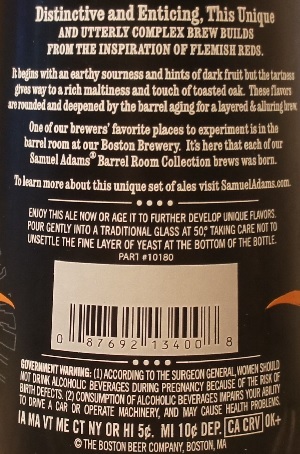 It’s here that each of our Samuel Adams Barrel Room Collection brews was born. Intro: A 1pt 9.4 fl oz corked and caged bottle with a best before date of 1st February 2018. Poured into a Chimay goblet glass. Appearance: A clear dark copper orange colour with a slightly less than two finger off white head that had great retention, eventually settling down to a nice creamy layer, while leaving great curtain like lacing. Aroma: Belgian yeast, banana, clove, honey and pear with hints of spice. Taste: Some light banana and clove at the beginning, followed by spice, candi sugar, orange and pineapple with quite a strong hit of alcohol on the finish. Mouthfeel: Creamy, full bodied with moderate to high carbonation. 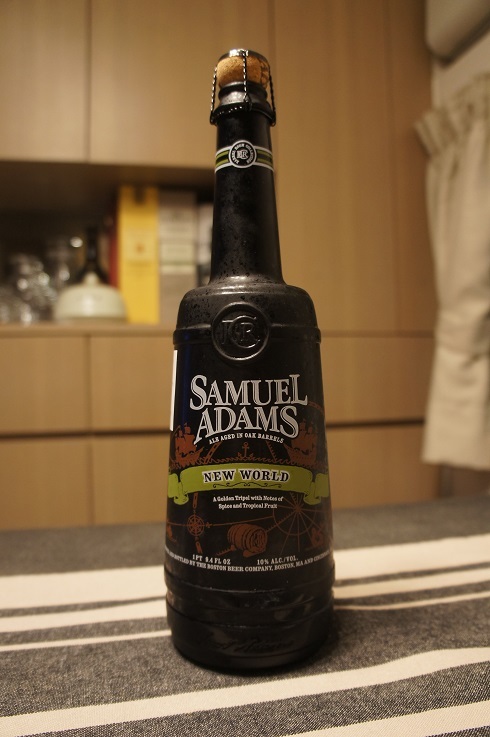 Overall: It looks great, and smells nice, but the strong alcohol on the finish was quite harsh in my opinion. Brewer Description: (from bottle) Distinctive and enticing, this unique and utterly complex brew builds from the inspiration of Flemish reds. It begins with an earthy sourness and hints of dark fruit but the tartness gives way to a rich maltiness and touch of toasted oak. 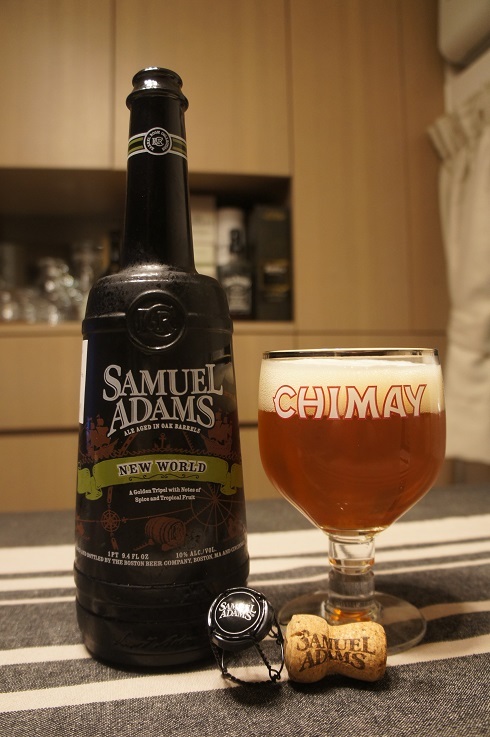 These flavors are rounded and deepened by the barrel aging for a layered & alluring brew. One of our brewers’ favorite places to experiment is in the barrel room at our Boston Brewery. 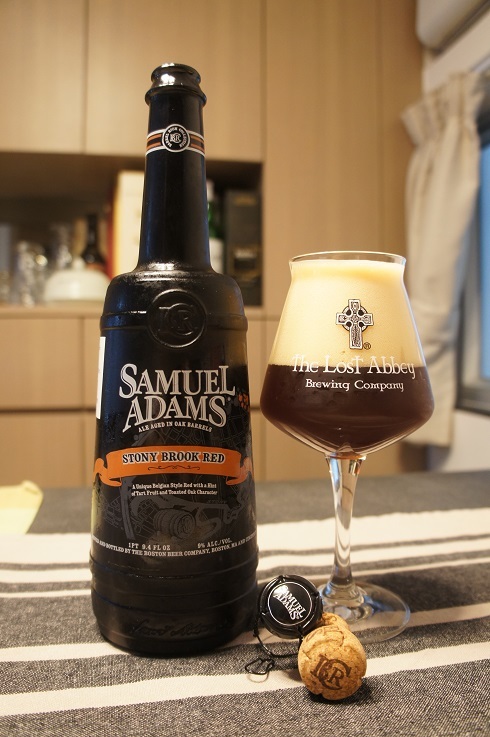 It’s here that each of our Samuel Adams Barrel Room Collection brews was born. Intro: A 1pt 9.4 fl oz corked and caged bottle with a best before date of 1st October 2017. Poured into a Lost Abbey teku glass. Appearance: A dark ruby reddish brown colour with a big three finger light tanned head that had decent retention and left only sparse lacing. Aroma: Fruity tart cherry, red berries, grape, plum, caramel and a touch of vinegar. Taste: Much less fruit than the aroma, sour, tart, cherry, plum, oak, alcohol and vinegar. Mouthfeel: Medium bodied and highly (overly) carbonated. 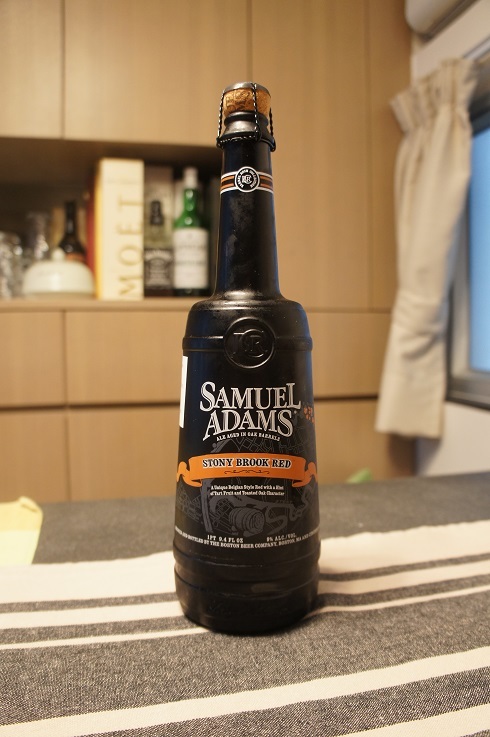 Overall: Taste was decent but I think its fruitiness was definitely affected by the harshness of the carbonation, which I felt mellowed it, when compared to the aroma. For me, the problem all stemmed from the harshness of the carbonation when swallowing, which I thought was way more than even any soda that I’ve drank before. If toned down a bit, I think that I would have enjoyed it a lot more.